In his book, Matariki: The Star of the Year, Dr Rangi Matamua tells us about Te Ara Wairua; the pathway of the spirits. He says “Māori belief determines that when an individual dies, their spirit leaves their body and undertakes a journey along Te Ara Wairua, the pathway of the spirits. This journey ends at the northernmost point of the North Island at a place called Te Rerenga Wairua, the departing place of the spirits. The dead travel along the rocky ledge towards the ocean where an ancient pohutukawa tree stands. They then descend down the aka (root) of this tree and disappear into the underworld. 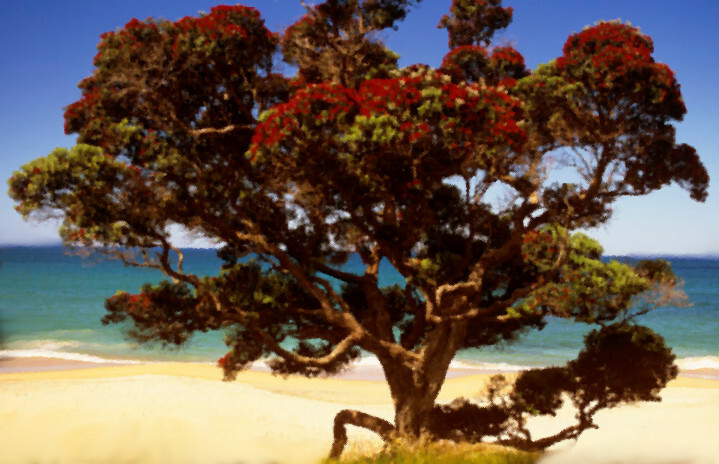 It is through Pohutukawa that Māori remember those who have died in the past year. all the pieces are re-assembled and ….. nō konei (voila) ! A masterpiece! Flip over the artwork so you are writing on the back side where you folded/drew the grid. Start at the upper left corner and number horizontally from left to right on each line. Each child recreates the piece of the puzzle they have focusing on colours, detail and enlarging their image. When they have finished their piece it is placed on the mat ready for each piece to come together to complete the image. Additional note: be creative! You might like to create your artwork using use hands, feet, .... anything.